Canadian Men's Team take home GOLD, Mixed Doubles Flynn & Orcutt take home SILVER, Flynn takes home BRONZE, and Team Canada receive FAIR PLAY TROPHY! Click here for the full story from the 2018 Junior Pan Am Squash Championships. Heading into the 2018 Junior Pan American Squash Championships the members of the Canadian squad [read more..] received impressive seedings - in the men's individual draw all three Canadians were seeded, with the highest Canadian seed going to James Flynn [3/4], followed by Elliott Hunt [5/8] and Dominic Wren [17/32]. The Canadian women all earned seedings as well, the highest Canadian seed went to Charlotte Orcutt [5/8], followed by Bethany Churchill [9/16], Mariam Mansoor [17/32] and Sarah Cao [17/32]. The action begins Sunday June 17, running through to Saturday June 23 with events in the Men's Team, Men's Individual, Women's Individual, Women's Team, Men's Doubles, Women's Doubles and Mixed Doubles. With pool play complete, the draws have been set. For the Men's Team draw, click here. For the Women's Team draw, click here. Main draw for both teams begin Friday June 22. The men take on #7 seed Peru, and the women take on #6 seed Barbados. Women's Team - Canada's women have been seeded 4th in advance of the pool play. In Pool A, Canada is joined with Team USA  and Team Mexico  and will play both their matches on Wednesday. Men's Team - the Canadian men's team have recieved the #1 seed. Joined by Team Guatemala  and host Team Brazil , Canada will play one match Wednesday and one match Thursday. Dominic defeated Nicholas Tinajero (ECU) 3-0, while Charlotte gave Arianna Alava ECU) 11-3. 11-3, 11-2 a lesson in length and tight rails. Highlight of the day so far was Bethany Churchill defeating the elusive Amanda Hayward (BAR) for the first time 3-0. Mariam Monsoor lost a heartbreaker 10–12 in the nail bitting 4th to Erika Parker (ECU) while Sarah Cao succumbed to the ⅝ seed Haley Aube (USA) on a wickedly hot court. Stay tune for the men’s evening match results. Canada’s James Flynn and Elliott Hunt both advance to the QFs in the men’s individual draw later this afternoon. Earlier in the day Elliott, facing Kamal Comberbatch (BAR) was down every game but through amazing gets, battle of the drops and sheer determination he closed the deal (11-5, 11-9, 9-11, 11- 9) to advance to the quarters. James faced the USA’s Nick Spizzirri to a 3-0 (11-8, 11-6, 11-8) victory on his way to earning his spot in the QFs. Later in the afternoon, James faced Peru's Martin Leon in the qaurter-finals and won in 3 straight [11-3, 11-5, 11-4] and now advances to the semi-finals. In the women’s individual draw, Bethany Churhill defeated 5/8 seed Rafaela Albuja (ECU) 3-1, and will advance as the sole Canadian in the QFs. She now faces Maria Paula Moya [3/4] of Ecuador later this afternoon. 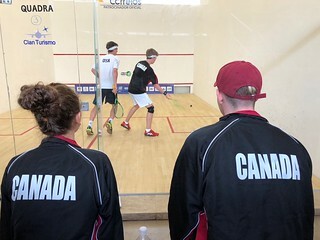 The Mixed Doubles first round saw Canada’s James Flynn & Charlotte Orcutt take down Guatemala (11-9, 11-4) and will face Mexican duo F. Santiago Hernandez & L E. Regalado Delgado tomorrow (Tues. June 19). Day 3: Mixed Doubles Duo Going for Gold! Facing the #2 seed, Mexican duo F. Santiago Hernandez & L E. Regalado Delgado, Canada's James Flynn & Charlotte Orcutt took to the court with sights set on reaching the semi-finals and giving themselves the chance to compete for gold. Flynn & Orcutt dropped the first game but would bounceback taking the next two and the victory, earning their place in the semis and ensuring Canada would take home a medal. In semi-final action later in the day, the Canadians had a stellar performance beating rival USA duo C. Little & A. Manning. The Canadians will go for the gold tomorrow (Wednesday June 20) at 5:40pm (4:40pm EST). Prior to the mixed doubles semi-finals, James hit the court for his men's individual draw semi-final. Flynn would come to face the top seed Leonel Cardenas (MEX) in hopes of earning the chance to play for gold. Although a great match by both it would not be Flynn's match as the top seed came through with the victory 3-0 [11-4, 11-6, 11-8]. Flynn finishes the men's individual draw with a bronze medal. The men and women started the teams event today. This morning, bright and early, the Canadian women’s team took on once again the prideful red, white, and blue flag. USA being the hot favourites withstood the Canadian blizzard by a tough 3-0 win over Canada. Next was the men’s trio team that faced up against the Guatemalans in their first match of the pool play. A great start for the men’s team with a solid 3-0 over the rapid Central Americans. The Canadian women’s team played again in the early afternoon, this time bringing in our #1 girl Charlotte Orcutt against a very tough Mexico. Canada being down 0-1 in matches, Charlotte pulled off a solid 3-1 win to tie the score board. Bethany Churchill gusted out a 3-2 win to give Canada the victory. Finally was the match that everyone was waiting for : the mixed doubles finals. James and Charlotte matched up against Ecuador for a match that made not only the players but the spectators to sweat. So close and yet so far from the gold, Canada unfortunately lost out to a better duo in a nail bitting 2–1 loss. If it’s any consolation, more people were watching Canada’s final instead of the men’s mixed doubles final which was going on at the same time.